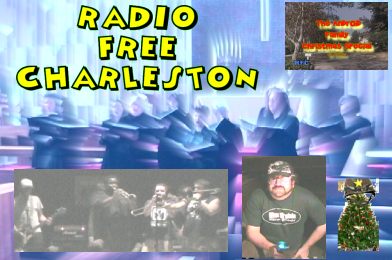 Radio Free Charleston Episode 32, “West Virginia Shirt” is online now! This show features Mountain Laurel Ensemble, 69 Fingers, The Android Family and more. It’s hosted from Stately Radio Free Charleston Manor (I stole that joke from Heidi MacDonald, who stole it from the old Batman TV show) and it’s part of the Christmas that almost wasn’t. Later today, this post will be fleshed out with full production notes, but right now, I gotta go get something to eat. Nice job Rudy!!!! Love the Android Family! Whoop! Whoop! This year, Christmas was exposed to radiation. It glow in the dark and fight crime, suh.